For the American Civil War action on April 8, 1862, see Battle of Shiloh. Major Gen. "Mad" Anthony Wayne, commissioned by President George Washington to bring U.S. sovereignty to the western frontier, commanded about 2,000 men, with Joseph Bartholomew, Choctaw and Chickasaw men serving as his scouts. Wayne's army was buttressed by about 1000 mounted Kentucky militiamen under Gen Charles Scott. Wayne's Legion arrived in the Maumee River Valley in Aug. 1794, where he constructed Fort Defiance and Fort Deposit in preparation for the battle. Blue Jacket took a defensive position along the Maumee River, not far from present-day Toledo, Ohio, where a stand of trees (the "fallen timbers") had been blown down by a recent storm. The Native American forces, numbering about 1,500, were composed of Blue Jacket's Shawnees, Buckongahelas's Delawares, Miamis led by Little Turtle, Wyandots led by Roundhead (Wyandot), Ojibwas, Ottawas led by Turkey Foot, Potawatomis, Mingos, and a British company of Canadian militiamen under Captain Alexander McKillop. The battle lasted less than an hour. Wayne's soldiers closed and pressed the attack with a bayonet charge. His cavalry outflanked Blue Jacket's warriors, who were easily routed. The Indian warriors fled towards Fort Miami but were surprised to find the gates closed against them. Major William Campbell, the British commander of the fort, refused to assist them, unwilling to start a war with the United States. Wayne's army had won a decisive victory. Wayne's army had lost 33 men and had about 100 wounded. They reported that they had found 30-40 dead warriors. Alexander McKee of the British Indian Department reported that the Indian confederacy lost 19 warriors killed, including Chief Turkey Foot of the Ottawa. Six white men fighting on the Native American side were also killed, and Chiefs Egushaway and Little Otter of the Ottawa were wounded. The soldiers spent several days destroying the nearby Native American villages and crops, then decamped. After withdrawing from the area, Wayne marched his army unopposed to the Miami capital of Kekionga in what is today northeastern Indiana and constructed Fort Wayne, a defiant symbol of U.S. sovereignty in the heart of Indian Country. In the following year, three treaties, the Treaty of Greenville, Jay's Treaty and Pinckney's Treaty, set the terms of the peace and defined post-colonial relations among the U.S., Britain and Spain. The Northwest would remain largely peaceful until the 1811 Battle of Tippecanoe. Tecumseh, a young Shawnee veteran of Fallen Timbers who refused to sign the Greenville Treaty, would renew American Indian resistance in the years ahead. 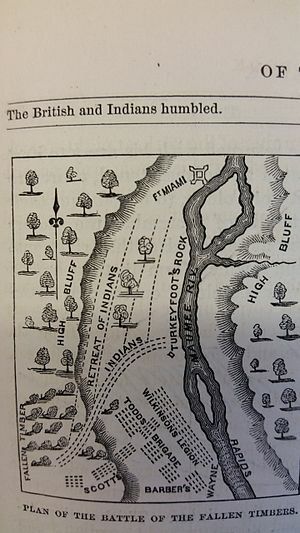 For 200 years, the site of the Battle of Fallen Timbers was thought to be on the floodplain on the banks of the Maumee River, based upon documentation such as the map above and to the right (location of Fallen Timbers Monument). Dr. G. Michael Pratt, an anthropologist and faculty member at Heidelberg University (Ohio), correctly surmised the battlefield was 1/4 mile above the floodplain after considering documentation that described a ravine. The City of Toledo owned the area which was desirable for development. Although the City of Toledo initially refused archaeological exploration, in 1995 and 2001, Pratt was able to conduct archaeological surveys, which relied primarily on metal detection, which revealed musket balls, pieces of muskets, uniform buttons and a bayonet, confirming that major fighting had taken place at the site. 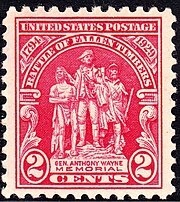 On September 14, 1929, the United States Post Office Department issued a stamp commemorating the 135th anniversary of the Battle of Fallen Timbers. The post office issued a series of stamps referred to as the 'Two Cent Reds' by collectors, issued to commemorate the 150th Anniversaries of the many events that occurred during the American Revolutionary War (1775-1783) and to honor those who were there. Because of Pratt's archaeological work and advocacy the Fallen Timbers Preservation Commission, the land was granted National Historic Site status in 1999. A federal grant allowed the Metroparks of the Toledo Area to purchase the land where the artifacts were found in 2001, and the site was developed into a park in affiliation with the National Park Service. The Ohio Historical Society maintains a small park at the site originally believed to have the main fighting (similar historic picture above and right). This site features the Battle of Fallen Timbers Monument, honoring both Major General Anthony Wayne and his army and Little Turtle and his warriors. Additionally, there are plaques describing the Battle of Fallen Timbers and honoring the several Indian tribes that participated. The main monument has tributes inscribed on each of its four sides honoring in turn, Wayne, the fallen soldiers, Little Turtle, and his Indian warriors. The park is located near Maumee in Lucas County. Turkey Foot Rock, marking the death place of Turkey Foot, is also at the site. ^ Gaff, Bayonets in the Wilderness, p. 327, gives the claim of 30–40 bodies found as well as McKee's figure of 19 killed. Sugden, p. 180 mentions 6 whites killed, giving a minimum of 25 dead. ^ Loosing, Benson (1868). The Pictorial Field-Book of the War of 1812. Harper & Brothers, Publishers. p. 55. ^ Pratt, G. Michael (1995). "The Battle of Fallen Timbers: An Eyewitness Perspective". Northwest Ohio Quarterly. 67: 5. ^ Pratt, G. Michael (2004). "Remote Sensing Surveys at the Fallen Timbers Battlefield National Historic Site" (PDF). Ohio Valley Historical Archaeology. 18. Retrieved June 4, 2016. ^ Keller, Christine; Boyd, Colleen; Groover, Mark; Hill, Mark (2011). "2011 Archaeology of the Battles of Fort Recovery, Mercer County, Ohio: Education and Protection". Retrieved June 4, 2016. ^ Library of Congress (2000). "Fallen Timbers Battlefield". Local Legacies. Retrieved June 4, 2016. ^ "The Battlefield [Fallen Timbers] Today". Metroparks Pamphlet. Archived from the original on June 10, 2016. Retrieved June 4, 2016. ^ Vezner, Tad. "Change Bears Down on Historic Battlefield". The Blade. Toledo Blade. Retrieved August 11, 2014. ^ "Turkey Foot Rock". The Historical Marker Database. Retrieved June 4, 2016. ^ "FALLEN TIMBERS BATTLEFIELD AND FORT MIAMIS NATIONAL HISTORIC SITE General Management Plan May 2006" (PDF). National Park Service. Retrieved June 4, 2016. Sword, Wiley (2003) . President Washington's Indian War: The Struggle for the Old Northwest, 1790-1795. University of Oklahoma Press. ISBN 978-0-8061-2488-9. Winkler, John F. (2013). 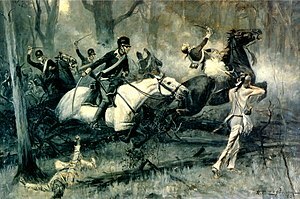 Fallen Timbers 1794: The US Army’s first victory. Bloomsbury Publishing. ISBN 978-1-7809-6377-8. Wood, Gordon S. (2009). Empire of Liberty. Oxford University Press.